The high-stakes legal dispute that will determine the future of Viacom is playing out in multiple theaters, and the question that comes up in each jurisdiction is whether 93-year-old Sumner Redstone will be examined for mental competency. A Delaware court heard arguments this week over the shakeup on Viacom's board. Next week, the drama will shift back to a suburban Boston courtroom, where embattled Viacom CEO Philippe Dauman is challenging his removal from a trust that will take control of Viacom (VIA) and CBS (CBS) once Redstone, the controlling shareholder, is dead or incapacitated. At a hearing Wednesday in the Delaware Court of Chancery, a judge weighed arguments over whether to approve or block Redstone's replacement of five directors -- including Dauman -- from the Viacom board. The court will have the ultimate say on whether to affirm the changes to the board. The shakeup was announced by National Amusements, the Redstone-owned movie theater chain that owns 80% of Viacom's voting stock. The judge, Chancellor Andre Bouchard, took a slow approach to the proceedings. Bouchard said he would aim to schedule another hearing in July, but signaled that he also wants to see what transpires with the lawsuit in Massachusetts. The saga will now return to Canton, Mass., about 15 miles outside of Boston, where attorneys for Redstone and Viacom will convene next Thursday for a hearing in the lawsuit brought by Dauman and George Abrams over their removal from the Redstone trust. The Redstones have filed a motion to have the suit dismissed. The suit asserts that the changes made to the trust were orchestrated by Redstone's daughter, Shari, who the plaintiffs accuse of manipulating her elderly father. 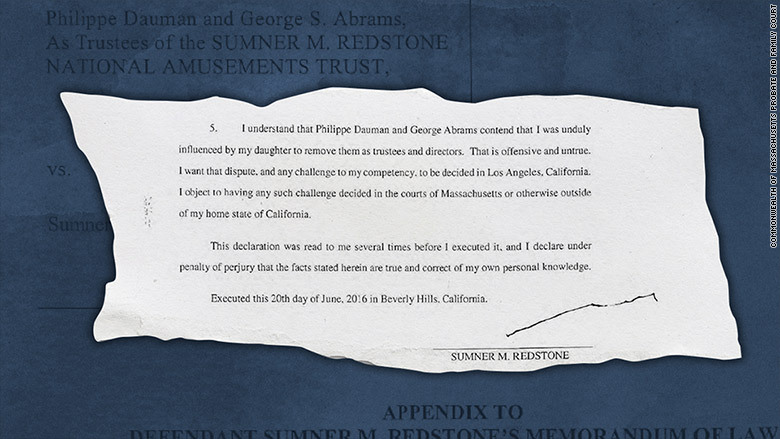 Sumner Redstone fired back at those accusations in an affidavit filed earlier this week. 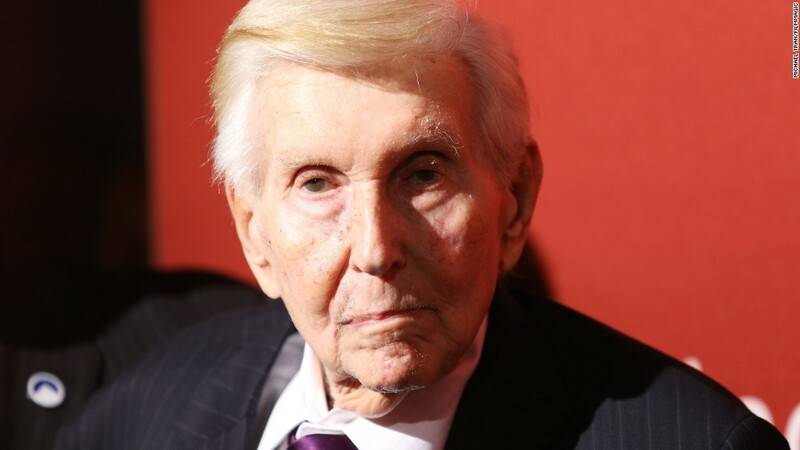 "I understand that Philippe Dauman and George Abrams contend that I was unduly influenced by my daughter to remove them as trustees and directors," Redstone said. "That is offensive and untrue." Redstone's signature on the document was just a tailing line of ink. He also asked for the case to be moved from greater Boston to Los Angeles, where he lives. Dauman and Abrams have requested the Massachusetts court to order a medical examination of Redstone. Fred Salerno, another board member Redstone has sought to replace, asked the same of the Delaware court on Wednesday. It may now be only a question of who grants the request. On Wednesday, Chancellor Bouchard said that the underlying issue of Redstone's mental competency "may well be relevant" to the case surrounding the board shakeup. Bouchard asked to be kept abreast of what happens in Massachusetts. "For example, if discovery proceeds there, I want to know about it," he said. "If discovery is shut down there, I want to know about it." If the question of Redstone's competency weren't being litigated in Massachusetts, Bouchard said, it "would be a legitimate issue here." The Redstone camp has asserted that the recent personnel moves have nothing to do with Redstone's daughter, and everything to do with the performance of Dauman. Dauman has been under fire for overseeing weak ratings at some of Viacom's major cable networks. Viacom's shares have shot higher lately due to the possibility that Dauman might be replaced as CEO and in the hope that the Redstones may be able to reunite Viacom with CBS. The company's financial performance remains poor, and Viacom just warned that earnings will be hurt due to the box office flop of Paramount's latest "Teenage Mutant Ninja Turtles" movie.